The NASW International Committee explains how an international experience can be a transformative event. At a time when many people and politicians globally are becoming more isolated and suspicious of each other, as coauthors and members of the NASW International Committee, we believe that learning from each other's experiences cross-nationally improves a practitioner's daily work and the quality of life worldwide. Social work practitioners can inadvertently narrow the focus of their practice to only day-to-day problems. That narrowing of focus can limit practitioners' abilities to see, link, and challenge issues of social justice affecting client systems locally and globally. International experiences can expand perspectives to include global perspectives, when possible, and is perhaps even necessary for social worker practitioners, social justice goals, and the social work profession as a whole. According to the International Federation of Social Workers, "Principles of human rights and social justice are fundamental to social work." The current global grassroots movements for social justice emphasize a focus on economic justice, the breaking of barriers to social mobility, and the creation and maintenance of safety nets. Facilitating access to shelter, health care, and food security is critical to the goal of social justice. Historically, international development has been almost synonymous with economic development and is used in a multidisciplinary context of human development and quality of life. Social justice is achieved when social workers in international programs help those who do not have adequate access. There are many actions social workers take to contribute to social justice. Facilitating knowledge exchange, serving as a catalyst or sounding board, and acting as an ally are all skills social workers exhibit as part of international development experiences. Often it is the will to act that is critical to improving the lives of those in poor and isolated communities. International collaboration generates increased interest. Even small international development programs offer support that results in strengthening service systems and community programs. There are opportunities to collaborate in program design and planning as well as research and evaluation. Research and evaluation, the foundations of evidence-based programming, are often essential to gaining secure funding. Resources are rarely adequate in poorer developing countries, so maximizing the benefit of the resources that are available is a challenge social workers may have to take on. Seeking funding through assisting with grant writing for specific initiatives is another way to make a concrete contribution. Collaboration in the form of public education campaigns (e.g., the World Health Organization's campaign on HIV prevention and awareness) or student exchange programs generates increased interest and creates public will to improve circumstances of the very poor. Social work practitioners and the profession have an ethical obligation for social justice. Whether it's for basic human needs such as shelter and food or the right to education, health care, safety, and security, social workers promote these positive outcomes in direct service, research, and policy development. For example, Social Workers Beyond Borders, a small international development organization, collaborates with government ministry staff, local-level service workers, and community groups to discuss ways to strengthen service systems, community development initiatives, building capacities, and systems-strengthening efforts—helping people who have nothing to have a voice, organize themselves, and create ways to generate income through micro financial initiatives. Social Workers Beyond Borders' experiences internationally show that often even a very simple or time-limited intervention can have a major impact on achieving social justice. International experiences can reap not only macro-level social justice but also micro-level benefits for social workers and their practice. Two of the more important outcomes that can come from international professional experiences include the participation in transformative learning and the opportunity of enhanced cultural humility. • integrating these new ways of being into everyday life. Participation alone is not enough. Critical reflection on the experience forms a crucial part of the process. In order for a transformative learning experience to occur, we also need to engage in critical reflection on assumptions about what we know and how we know it. Emotions often serve as a trigger for this kind of reflection, along with the opportunity to talk with those sharing, or at least observing, our experiences. This process can lead us to question deeply held assumptions, producing a shift in how we see ourselves and the world; this shift often benefits our practice with new insights. Transformative learning is a process, not an event. International experiences provide fertile ground for transformative learning; they present the quintessential disruptive experience. Adapting to different cultures forces an awareness of one's assumptions and beliefs. To benefit, learners need to engage with critical reflection, making mentors and fellow travelers essential to the process. Cultural competence remains an essential goal for professional social workers. Cultural humility, as a practice skill, does not replace cultural competence, but it can enhance its attainability. According to Robert Ortega, PhD, a social work scholar and associate professor at the University of Michigan, "Cultural humility is an acknowledgment that others know more about themselves than what our expert knowledge may tell us." Cultural competence can feel impossible to fully attain, and understandably so. Perhaps only those who are actually members of a culture can truly hope for such attainment. And even then, attainment may not be possible given that each person possesses only the slice of their culture that they have experienced and reflected upon. Acknowledging that others know more about themselves than any professional social worker does just makes sense. Cultural humility is a mindset that, if successfully adopted, can ease the process of trying to attain cultural competence. Cultural competence requires valuing diversity, developing cultural self-awareness, appreciating the dynamics of cross-cultural interactions, and being knowledgeable about within-group cultural differences in order to support the delivery of relevant and responsive services to meet the diverse and complex needs of individuals, families, social networks, and communities. The first component of a mindset of cultural humility has to do with cultural self-awareness. Practitioners must appreciate who they themselves are from a cultural perspective and how this shapes the lens through which they view the world—you only have the eyes and brain you have, so to appreciate how those eyes see and how that brain makes sense of what you see you must practice cultural self-awareness. You see through your own history and experiences—your culture. We like Ortega's words in "Training Child Welfare Workers From an Intersectional Cultural Humility Perspective: A Paradigm Shift": "People in a sense, walk the mile in their own shoes and therefore are privileged to know themselves far more than can be expected of others. By engaging in a process of realistic, ongoing self-appraisal of biases and stereotypes, workers are encouraged to assess the ways in which their own attitudes and behaviors prevent them from learning from their clients." The second component of cultural humility focuses on cultural openness. Social workers cannot expect to know all there is to be known about the world, including the people with whom they interact—their clients. Given that assumption, cultural humility requires social workers to be open to experiences from outside of themselves; it requires social workers to learn from the perspectives of others who know more than they do about their own experiences of the world. The third component relates to a more complicated notion: transcendence. Ortega quotes J. Andrew Morris, PhD, et al from a 2005 publication to explain: "Transcendence can best be thought of as an acceptance of something greater than the self. Out of this acceptance comes an understanding of the small role that one plays in a vast universe, an appreciation of others, and a recognition that others have positive worth." Cultural transcendence motivates social workers to consider that the world is more complex and dynamic than any one person can quite appreciate. Demonstrating an attitude of cultural humility frees you from the false impression that you are the expert. It places the social worker in what Ortega calls "a learning mode as opposed to maintaining power, control, and authority in a working relationship." An international professional experience for a social work practitioner provides the opportunity for accelerated appreciation of this valuable professional attitude. The bottom line: An international professional experience, even one of short duration, can kick-start a mindset of cultural humility. The transformative learning opportunity offered by an intellectually disruptive professionally focused international experience, along with the reflection that happens naturally as you process your experience alongside professional colleagues, opens and reinforces the gifts of cultural humility. Cultural humility prompts a values orientation that honors mutual respect and appreciation of the collective, and a lens through which the impact of social and institutional practices that condone social injustices becomes transparent. An attitude of cultural humility challenges the false notions of our own expertise when it comes to the lives of our clients. Since social workers worldwide face similar challenges due to common societal and economic upheavals, international immersions into another culture's professional work enhances best practices to benefit your everyday practice. Some problems can only be solved with local know-how. But there are many that benefit from outside-the-box perspectives. That "outside" experience provides insights and solutions that you may have never considered otherwise. What could be more "outside" than outside your own country? • "Viewing another culture's interventions enables me to consider aspects of my practice and, while not wholly importing techniques, it provides the opportunity to review, evaluate, and modify my own practice." • "Going to a different cultural context allows one to see things from a different perspective, which in turn strengthens and straightens one's own." • "Opening doors to professionals from a different country and culture gives us such a unique opportunity to continue to assess and celebrate what we have been doing well here and to learn about what we could improve." 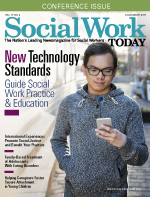 The social work profession is no longer just local. The world has become an interconnected global community. Social workers will be left behind in addressing a range of social ills and challenges if those "in the trenches" don't begin to look outside of their local community. International experiences offer an opportunity for a unique kind of self-care and a chance for professional self-reflection with an international perspective. Old problems and new problems can benefit from "outside-the-box" solutions. International experiences imbue participants with a broader vision of their profession from local to worldwide. Participants gain a heightened appreciation of the need for knowledge of global priorities and strategies to advance social work education, research, knowledge development, and practice skill development while building organizational capacity through sustainable projects. They also develop a sense of camaraderie in international social work exchanges that can lead to future collaborations. Another benefit, cultural humility, is a fundamental respect and appreciation for indigenous cultural practices in shaping the social work context. As a result, participants are better able to reflect on their own professional practice and further their cultural humility and cultural competence skills. • "This international experience has enriched me and my work in my home city, and I return with many new ideas to help our social work." • "Exchanges begin to build an interconnected web of international experiences and specialties to improve social services globally." • "I am a little bit of another person after this international experience, and I think it is very important to do this." • "If you do not see and experience the person's culture, you do not see and experience the whole person and may make untrue assumptions." • "I have learned the importance of developing meaningful, impactful international collaborations and alliances for the mutual benefit of all, especially the local service community." As coauthors and NASW International Committee members, we believe that best practices and policies to address social problems should have no boundaries. We believe that learning from each other's experiences improves the quality of life worldwide. International experiences bridge cultural, national, and interdisciplinary boundaries. Social workers who experience an immersion into another culture become engaged in cultural dialogue. That process develops opportunities for those working closest to social challenges to reexamine their assumptions, professional strategies, and belief systems. This immersion enhances cultural understandings, overcoming cultural divisions and increasing professional networks and ongoing projects that promote human potential and functioning in participants' home cities and the world. We hope from reading this article, your awareness of the benefits of international experiences for social workers has increased. To help you further explore international experience possibilities, we have collected information and created a chart, available at socialworkers.org/nasw/swan/International_Chart.pdf, listing some organizations that help provide social workers with international experiences. If you are like many social workers who find it difficult to imagine how an international experience can benefit your social work practice, the NASW International Committee encourages you to reach out and explore these international venues. We hope you find these helpful and that you will consider an international exchange in your future and become as passionate about them as we are for the social work profession and for our everyday social work practice. As you review the chart, notice our effort to provide enough detail for you to reach out and find a way for you to engage internationally, including a bit of information about finance. We know time and money are the two biggest hurdles, so we intended this chart to address them. The organizations we've identified provide experiences of differing lengths, but at least some of them could fit within a busy professional's schedule. If you know of any additional opportunities, we would love to hear from you. As members of NASW's International Committee, we continue to passionately educate social workers about how international experiences bridge cultures to address common social challenges and achieve social justice. Best practices and policies to address social problems should have no boundaries, and learning from each other's experiences lessens cultural divides and improves the quality of life in our global community. Immersed in international experiences, social work practitioners can become a conduit to improve not only their day-to-day practice but also social justice and cultural discourse that enhances mutual respect, cultural humility, and the social work profession. For more information, visit NASW's Social Workers Across Nations at http://socialworkers.org/nasw/swan/default.asp. — Debra Nelson-Gardell, PhD, MSW, LICSW, is coordinator of international programs at the University of Alabama School of Social Work. — Kathleen Borland, MSW, ACSW, LCSW, is chair of the social services exchange program at Chicago Sister Cities International. — Luisa Lopez, MSW, is deputy director of Social Workers Beyond Borders. — Robin S. Mama, PhD, LSW, is a professor and dean of the Monmouth University School of Social Work. — Stephanie Asare Nti, MSW, is director of Social Workers Beyond Borders.